Angel Sharks do not fight like to fight alongside Basking Sharks. Blacktip Reef Sharks like highly restricted rules of engagement (they do fine in captivity). Blacktip Sharks (distinct from the above) are more familiar with deviant behavior since they are from Florida, making them the Dutch of SharkNATO. 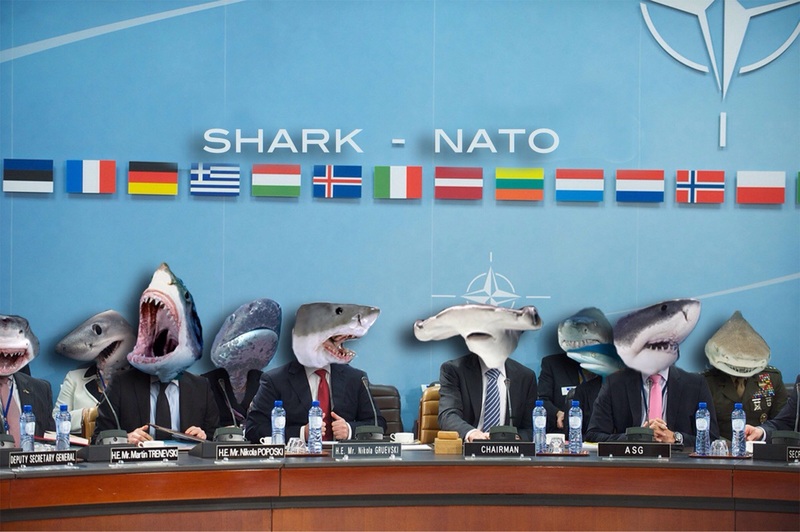 Bull Sharks are the Danes of SharkNATO, willing to go pretty much anywhere, salt water, fresh water, whatever. Hammerhead Sharks appear more dangerous than they are, making them the Aussies of the Shark war (see our book for why the Aussies were the most successfully deceptive contingent). Sandtiger sharks have no restrictions as they will eat their competitors in the uterus before they are born. Try telling them to engage in courageous restraint or not to fight at night. Tiger sharks have no restrictions–they will fight/eat anything anywhere anyhow. Of course, the question we would ask, given our findings, is how many veto points is there in each shark community?